Starting an Untemplate lifestyle can feel overwhelming at first, but don’t worry because we’re here to help! There’s a lot to take into consideration before launching a new career, figuring out how to become self employed, moving to a foreign country, or starting your own profitable online business. I know what it’s like to be working around the clock with a million things on your to do list and I want to save you lots of time and headaches. It can be stressful and scary venturing into the unknown, but I really believe in making the most out of life and finding ways to achieve our dreams. Here are some of my favorite recommendations so you can get started on the life you want! Personal Capital is a free online money management platform I use that organizes all of your money related accounts all in one place. It lets you safely and securely link your checking, savings, retirement, CD, mortgage, credit card, overdraft protection, and investment accounts together in the cloud. Since I use multiple banks and have over a dozen different accounts, being able to see all of my money in one place makes them SO much easier to manage. Their offices are also right in my backyard in Silicon Valley and SF. It’s free to join and takes just a minute to sign up and start using all of their fantastic tools. A few of my favorite features of their website are being able to add offline assets into my account (jewelry, heirlooms, electronics, etc. ), monitoring cash flow, viewing my net worth, saving money with their 401k fee analyzer and checking if my savings and investments are on track with their retirement calculator. If you want to be free and have more flexibility in your lifestyle, take control of your finances now and start paying more attention to your money. Start Your Own Website For Only $2.95! Starting a website doesn’t have to be complicated. It’s actually super easy now with Bluehost, a one stop shop to purchase domain names (URLs) and sign up for affordable, easy to use web hosting. For only $2.95 a month, you can even get your very own domain name for free! Bluehost also offers free instant setup, free site builder with templates, unlimited email accounts/file transfers/hosting space/domain hosting, and different web hosting plans to meet your needs. I recommend WordPress as a content management system (CMS) once you have signed up with Bluehost. I love WordPress and have been using it for over six years straight. As far as design and themes go for WordPress, I strongly recommend WP Engine. I switched from DIYTheme’s Thesis theme to the Genesis Framework in 2015 and am kicking myself for waiting so long to make the switch. Genesis is phenomenal and it’s the most popular framework amongst all of my blogging friends. Child themes, which sit on top of Genesis and give your site it’s custom look, are also fantastic. They have a wide selection of designs and all of them are super easy to use without any coding experience needed. Get started today with Bluehost, WP Engine and Genesis. One of Untemplater’s regular contributors is Sam Dogen of FinancialSamurai.com. He’s THE guy you go to if you want financial advice, guidance on the real estate market, and help with starting a new career you love with money in the bank. His popular eBook, How To Engineer Your Layoff, is the resource you can’t miss if you are thinking about leaving your current job to do something else. I was actively involved in the editing and launch of this ebook and I can assure you it’s filled with helpful, easy to follow tips, and a step by step guide on how to get paid to leave your current job! After the first edition was released, I used the knowledge I learned from this book and negotiated my own severance package. Getting paid to quit my job literally changed my life thanks to this book! The second edition of the book was also recently released and includes 50 extra pages and more resources. Read examples of people just like me who successfully launched new careers and lifestyles. You’ll also find out everything you need to know to get started. To learn more and purchase the book, head to the store page or click on the banner below. 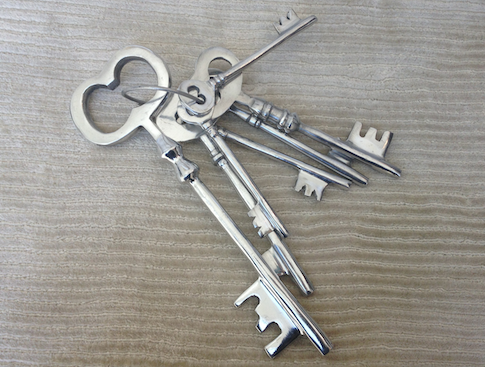 Want to increase your financial knowledge and grow your wealth? Want to give back in the process too? 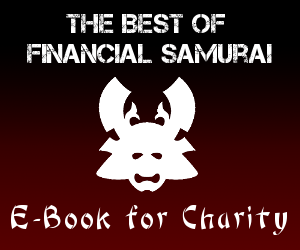 Check out The Best of Financial Samurai eBook. It contains 180 pages of the best 35 articles written by Financial Samurai over the past seven years to help readers achieve financial freedom sooner. All of the book proceeds are donated to a charity that helps inner city kids stay off the streets and stay in the class rooms. You can purchase The Best Of Financial Samurai here for $9.88. Why not learn and give at the same time! With identity theft rates rising like crazy, protecting your identity and credit score is more important than ever. You can check your latest Experian credit score for free straight from their website. It’s best practice to check your credit score and report every month to monitor your information and make sure no one has opened new credit lines using your identity. It’s also a good idea to see what your credit score is on a regular basis before applying for a loan. If it’s below 720, you won’t get the best rate, but at least you can spend time to improve your score. Furthermore, 1 out of 4 credit reports have errors, negatively affecting one’s credit score. Check your credit score today. I can’t even count how many purchases I’ve made on Amazon.com. I love, love, love this site. From office supplies like printer ink, to noise canceling headphones, iPhone cases, water filters, organic multi vitamins, ebooks, electronics, they have it all and their prices can’t be beat. If you are, then it’s likely you’ve found the path to the comfortable, stable “American dream.” You’ll spend most of your life in a small cubicle grinding away long hours to impress your boss, slowly climbing the corporate ladder, with far off dreams of retiring. You’re probably wondering do lifestyle and financial freedom only start after retiring at 65? What if we told you it doesn’t have to be that way? Download the Untemplater Manifesto and read inspirational stories of people just like you who embraced an untemplated lifestyle in their 20′s and 30′s. And it’s free! Check out my 55 Bucket List Ideas And Tips and find out why you need to make a bucket list today! You can also follow my progress on my own bucket list. Get advice on starting a new chapter in your life in my post What Do You Do When You Don’t Know What You Want To Do With Your Life? Check out our popular Untemplater categories in Personal Finance, Entrepreneurship and Freelancing, Careers, and Business.